The exponential gains in stocks have stalled, even as the USD continues a linear reversal and oil continues to rocket higher into the OPEC meeting Thursday. The curve and slope of risk continues to make for a very unpleasant ride for investors with hairpin turns, roller coaster inclines of worry, and questionable drivers. The inversion of the US rate curve throws many into a negative growth spin. Headlines overnight didn’t help anyone forget that they are in car without a seat belt – starting with Trump naming USTR Lighthizer as the lead negotiator for a China trade deal over the next 3 months.NATO meets today to talk about Russia and the Ukraine. The UK can reverse its Brexit decision unilaterally according to the ECJ opinion– adding to the view that December 11th could be the end of UK May government but also another way out of the Brexit mess with another referendum. The French PM confirms the government is suspending fuel-tax hikes but the yellow-vest protestors balk at talks. These headlines matter but the focus is on the fragile truce of trade and growth still with the USD reflecting the doubts about US divergence being central. The EUR is breaking out of its recent downdraft with 1.15 next while the CNY grabs all the headlines as its fixed stronger and runs nearly 1% stronger – watching 6.75 and 6.50 next. For most, CNY represents a measure of China growth and Xi success at home, for others it’s a risk barometer for all of Asia as it sets the export/growth tones that drive 2019 investment plans. 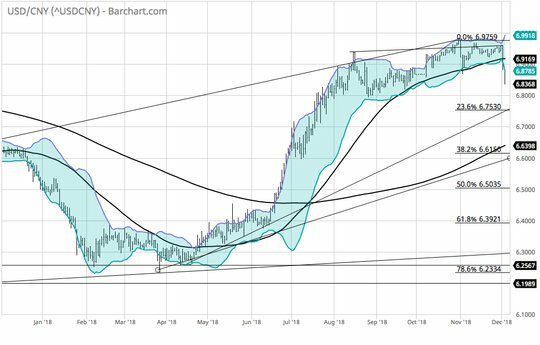 The break of the USD uptrend here means something more than today’s curves. Question for the Day: What are the new worries? Markets gave up on a Goldilocks view of the world overnight, blamed on rethinking US/China trade truces, but also linked to doubts about inflation/growth dynamics into 2019. 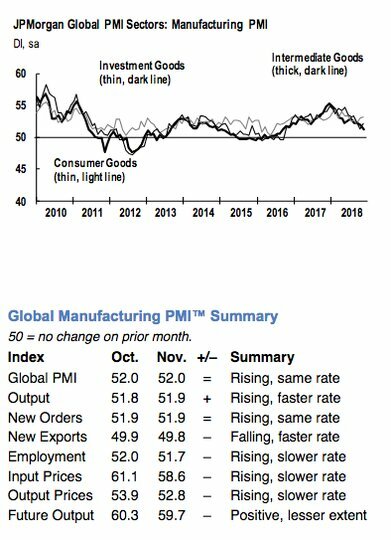 The first consideration is growth– with the JPM global manufacturing PMI clearly in a slowing mode unchanged at 52 from the October 23-month lows. The stall in export orders particularly in emerging markets is highlighted. On the other hand, input and output costs moderated. The second concern is China and its ongoing battle with credit and debt as the success of shrinking the shadow banking sector hits private sector funding and directly hits growth. The trade truce isn’t enough to convince China bears about the fragility of the economic rebound. The regulators appear to be turning on the tap again as the WSJ notes the rise in wealth management products increasing from June to October by 6% to CNY22.3trn.